Pupation occurs in the litter layer. Argentine stem weevil (Listronotus bonariensis), an exotic weevil of South American origin, is ubiquitous in agricultural and amenity turf environments throughout the country. It used to be rated New Zealand’s worst insect pest of pasture. With the sucessful introduction of a biocontrol agent and development of endophyte infected ryegrasses, Argentine stem weevil, although still a major pest, no longer has the impact it once had. The adults feed on a range of grasses but it is the larvae which develop and feed, predominantly, within the tillers of several agriculturally important grasses that are the main pest stage. 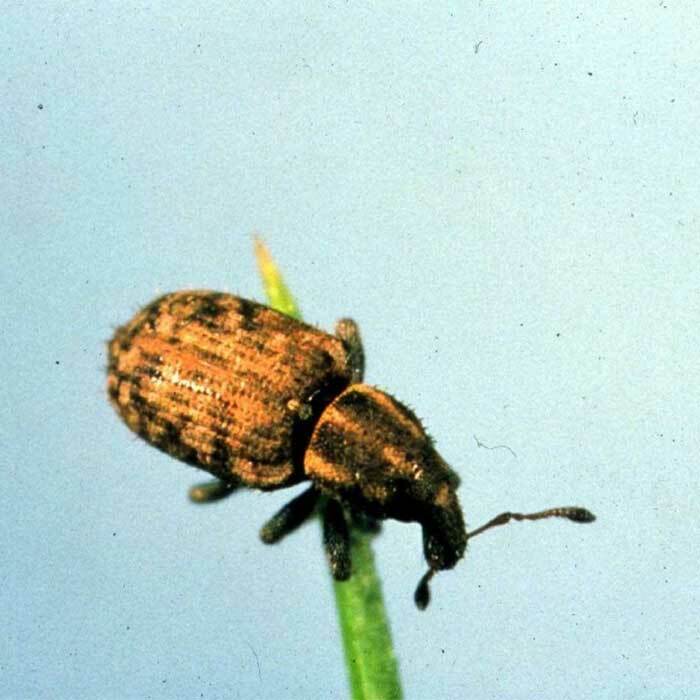 These weevils are a major pest of perennial ryegrass (Lolium perenne) in developed pastures, maize and cereal crops. Uncontrolled they have been estimated to cost the country up to $280m per annum. The adult weevil is a hard bodied compact beetle usually less than 3.5 mm long and 1.5 mm wide. It is grey-brown with three pale longitudinal stripes on its thorax. Its colour, small size and the fact that soil particles adhere to its body make adult weevils very difficult to detect by eye. Although it can be active during daylight, night is when it usually feeds on the leaf blades and lay its eggs. Adult weevils commence egg laying in spring as soon as temperatures allow (average daily temp 10°C). 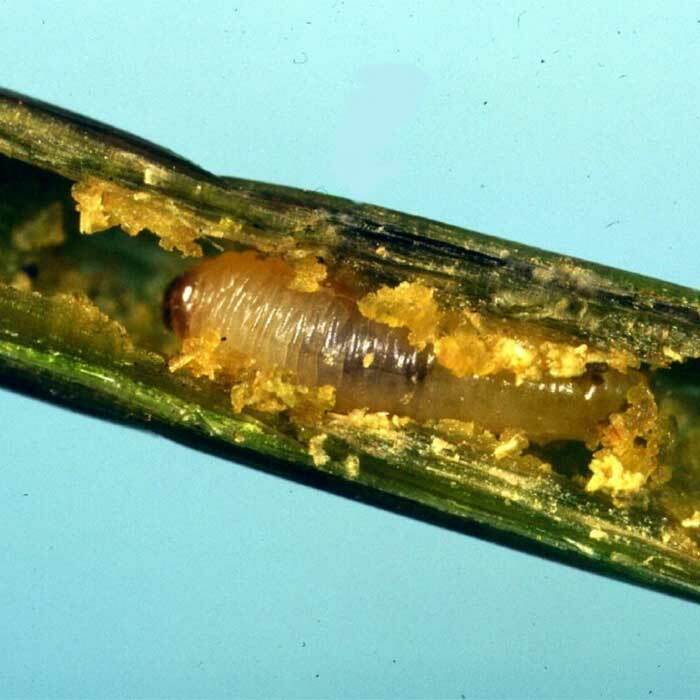 Eggs are laid in the sheaths of grass tillers. After hatching the white legless larvae tunnel and feed within tillers. Large larvae may live outside the tillers and within the plant crown especially if the tillers are small. Each larvae may destroy up to eight ryegrass tillers during development to adult and are capable of moving to new plants when required. The larvae pass through five stages of development before leaving the plants and pupating in soil. New adults commence laying eggs almost immediately after emergence from pupae giving rise to a new generation but egg laying is controlled by day-length and stops in Mid-March. The number of generations Argentine stem weevil can achieve in a year is driven by temperature. Pest status is reached when two or more generations occur as happens from Canterbury northwards. In Otago and Southland historically only one generation has generally occurred each year but anecdotal evidence suggests this has changed and stem weevil may be increasing in significance. The adult weevils can fly and mass dispersal flights can take place on calm, sunny days in summer and autumn. Grasses, especially Italian and endophyte-free perennial ryegrasses, seedling maize and cereals, are the main hosts. Adults have been reported feeding on germinating brassica crops but may easily be mistaken for native weevils which commonly do this. Adult feeding is characterised by “windowing” of the grass leaf near its tip. Windows are typically rectangular and appear as clear areas, the pane being the lower leaf cuticle which is left intact. Veins encountered while the adults feed are cut at the base and displaced. They appear as pigtail-like threads attached at the upper edge of the window. Adult feeding damage is not normally significant except in summer-sown pasture. Larvae mining the stem do the greatest damage to vegetative tillers, which wilt and yellow from the centre outwards. 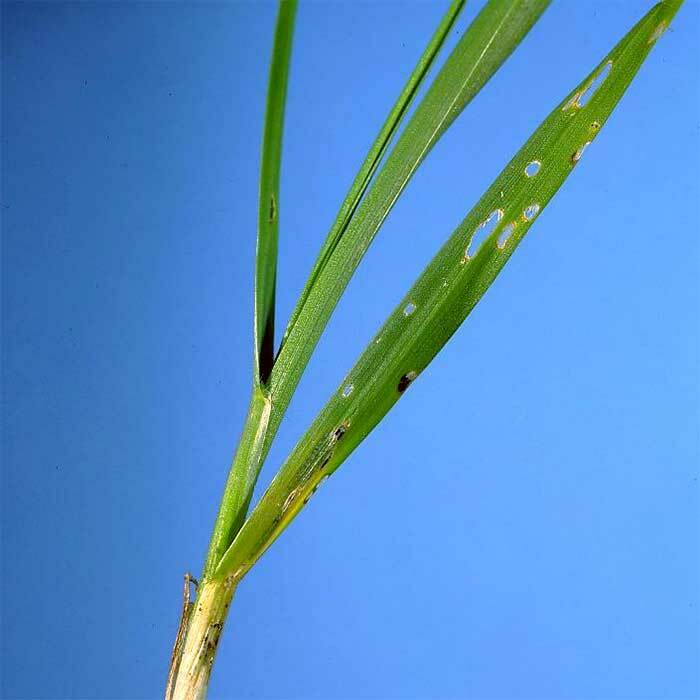 Damaged tillers contain larval frass and may show small, circular exit holes near the base. Flowering tillers when attacked whiten and may snap off owing to mechanical weakening. Where infestation is heavy, severe damage is done to the sward, particularly in dry conditions when pasture growth is retarded. 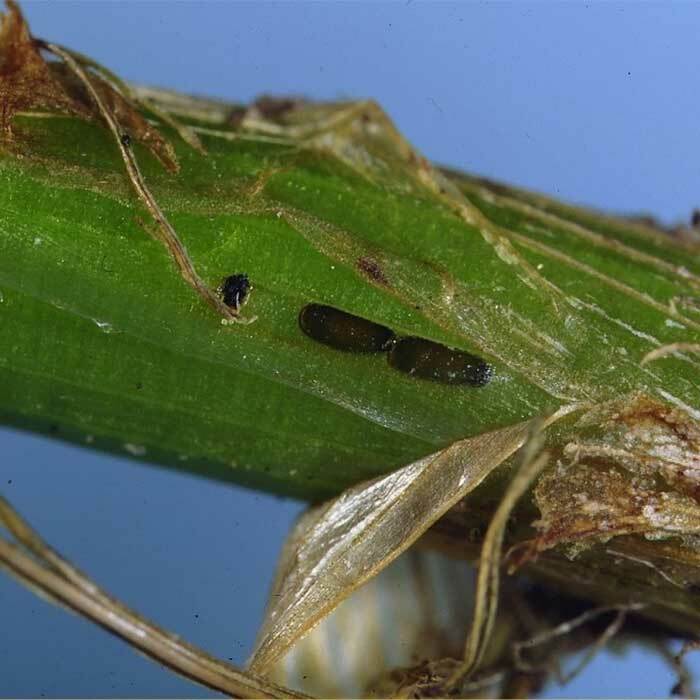 The presence of an endophytic fungus in perennial ryegrass makes it less susceptible to Argentine stem weevil attack. Endophytes do not occur in annual ryegrasses. Other pasture grasses, cereals and maize are are also affected by argentine stem weevil. They are often reported feeding on other plants e.g. brassica seedlings. In such instances this may be driven by shortage of grasses for food or the weevils may be seeking moisture. Several species of native weevils that appear superficially similar to Argentine stem weevil are common in some pastures and crops and these are easily mistaken for Argentine stem weevil. It is quite likely that most damage to non-grass crops attributed to stem weevil is due to native weevil feeding. Argentine stem weevil is difficult to control with insecticides. Several products are available that will kill adult weevils but pastures can be rapidly re-infested from others nearby. The larvae generally live within the plants on which they feed and are therefore protected from most insecticides. When establishing new pastures there are some options that can mitigate damage from this pest. Cultivation can destroy larval weevil populations and allow re-establishment of grasses into a clean pasture. This however will not protect against adults which may survive cultivation or re-invade the paddock. An insecticide can be used if necessary in this situation. Foliar sprays, prills drilled with the seed and seed coatings are available. If very high numbers of adults are present insecticide seed coating may not offer sufficient protection to avoid loss of seedlings. Even endophyte infected seedlings (see below) are vulnerable to attack while establishing. If direct-drilling is used to re-establish pastures larvae are able to survive in dying vegetation and migrate to new plants after sowing. As with all insect pests assessing the probability of damage will assist in choosing a control option. A small wasp, Microctonus hyperodae, was introduced to New Zealand in 1990 as a biological control agent and was released throughout the country. 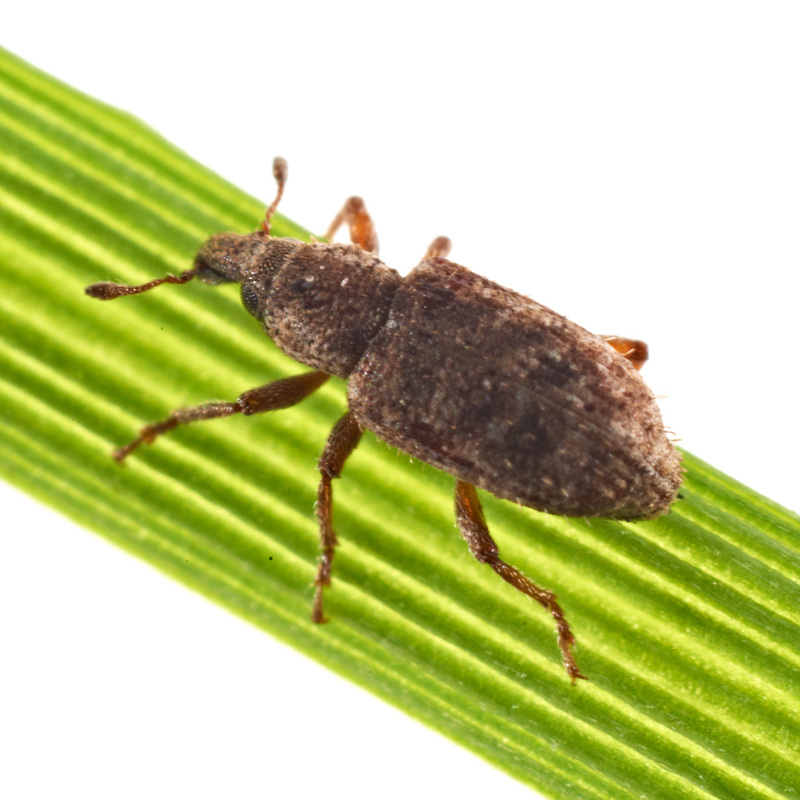 It is now well established in most areas and in combination with endophyte infected ryegrasses has reduced the impact this weevil formerly had on New Zealand pastures. This wasp is a parasite and lays its eggs inside the adult weevil. This sterilises and eventually kills the weevil. Endophyte is a term used to describe an organism that lives inside another. In this case the endophyte is a fungus called Neotyphodium lolii that lives within perennial ryegrass plants. Toxins produced by this fungus protect the plant from grazing. The “wild type” endophyte that can occur naturally in ryegrass, and used to be common in pasture cultivars, protected the plants from argentine stem weevil but was also responsible for stock health problems such as heat stress and ryegrass staggers. Plant breeders have been able to selectively improve the fungus and ryegrass cultivars are now available with a choice of endophyte. The most prominent of these is called AR1, but NEA2 in Trojan and AR37 are also effective. These forms of the endophyte protect ryegrass from argentine stem weevil but eliminate or reduce the effects on stock caused by the standard endophyte. When selecting perennial ryegrass cultivars for pastures, one of these endophytes should generally be used and form the backbone of argentine stem weevil management. AR37 and NEA2 in Trojan will also protect against other insect pests.